This small family owned company based in St Gallen, offers a nice range of chewing gum, all of them sugar free. Their chewing gum brands are DOC’s, FREEZER, PIX and HUSTOL. They come in many different sorts of packaging (plastic bottles, blister, flip top box, and even zip-bag). Most of them are coated gum pillows, but also mini-stick (or tabs). HUSTOL are filled dragees. 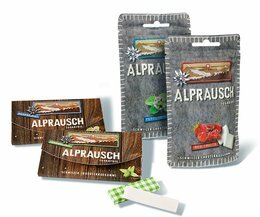 The novelty in this ISM has been ALPRAUSCH (herbal gum) with new flavors. This product was exhibited in the ISM New Product Showcase. Mr Nico Studer took the time to explain me the whole product range, so I thank him for that.